In a landscape dotted with pumpkin patches, haystacks, kitschy Halloween decor, and cozy small town life – murder is brewing. Amanda Hazard, former amateur sleuth now married to the town sheriff (always referred to by his last name – Thorn) is running her CPA business and lamenting the effects of pregnancy when a frantic call comes from longtime customer Nettie. Nettie has some sort of secret related to a big financial change and she wants to see Amanda now. 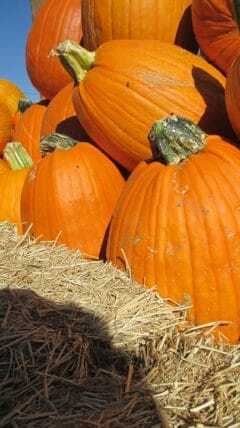 However, when Amanda arrives at Nettie’s cozy farm, intending to load up the truck with some festive pumpkins for the office after working out the numbers, she finds a stray cat and Nettie’s dead body. It looks like an accident, except for one minor detail and the disturbed feeling of Nettie’s house. Amanda’s instincts kick in but her skeptic husband is more interested in keeping her and the baby safe as the town buckles down and gets ready for an all-out Halloween celebration. But can independent, stubborn Amanda really let someone get away with murder? It may all end with a pumpkin costume, a baby, more dead bodies, a long held family secret, and a good dash of scandal. This is my first foray into the Amanda Hazard cozy mystery series, and I am already hooked. 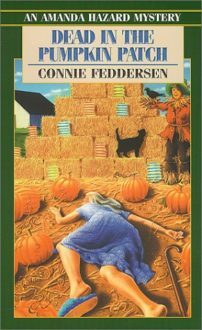 As the final book in the series, Dead in the Pumpkin Patch made me decide to buy all of the rest of the series and start from the beginning. Like Goldilocks’, this one is just right – a blending of solid plotting and suspenseful mystery with an atmosphere that is cozy personified. Add to that some screwball humor (Amanda’s adventure at the beauty shop will leave you howling), a vivid rural town with the best of vintage and modern combined, and a rollicking marriage with lots of love and plenty of amusing conflicts, and you have a series to die for. While Amanda is hardly the motherly type (one does wish that she would show some excitement or affection for the mostly burdensome baby) and does make some traditional mystery mistakes (aka leaving Thorn unprotected, leaving evidence in her home, and semi-indulging in a harmless flirtation that is nevertheless, hardly kosher) we love her, and her quaint world of Vamoose, Oklahoma, anyway. All characters have flaws and sharp tongued, determined Amanda has plenty. Usually, this is enough for me to walk away yet Amanda’s good side – the positive aspects of her determination, her intrepid sleuthing, her ultimately beautiful marriage, her bravery and sense of justice – balance the weights and create a real character, not the sappy ones of usual cozy mystery flavor. Thorn, too, is likable – dare I save lovable in his protectiveness. However, he is police in a cozy mystery story, meaning that he is ultimately clueless and it’s quite easy for the killer to pull the wool over his eyes on more than one occasion. One must conform to genre somewhat, even in a cozy mystery that is actually dedicated to solving a complex crime. The crime itself has the same weight as an Agatha Christie novel. While clues do occasionally land in the character’s outstretched hands, they are impossible to fore-guess and delightfully intricate. The mystery isn’t an addendum to the cozy but an integral part of the book’s addictive atmosphere and a critical element of focus. Unlike some cozies (one can think of any of the last ten Hannah Swenson mysteries) the mystery here is never forgotten and doesn’t rest easily in the background. The killer is active, scheming, and clever. Amanda herself feels the danger as she races against time (her baby’s delivery in this case) to sort out a tangled weave of old lives, lies, and the unpleasant ties that bind. Add in the spice of scandal, stir, and you have one confrontation schedule for Halloween Night and the big Vamoose bash when everyone is paying attention to the town parade and not the desperate actions of a psychotic villain. In the end, Dead in the Pumpkin Patch has it all. It’s not one of those cozies that you enjoy, set aside afterwards, and then forget. It’s one that introduces you to a new world – one you just must visit again. Equal parts cozy and chilling, this mystery has it all – humor, murder, love, intrigue, secrets, and Halloween shenanigans!